At a town hall meeting in Albion last Wednesday, Gov. 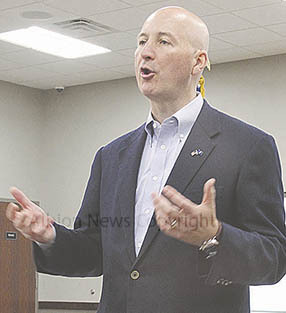 Pete Ricketts said he is now implementing ideas that he brought with him from the private business sector. He considers “growing Nebraska” a priority, and he presented a general plan to do that while an audience of more than 100 listened in the Cardinal Inn conference room. Ricketts was introduced by Doug Koch, executive director of the Boone County Development Agency, who presented the governor with a birthday cake to celebrate his 51st birthday on Aug. 19. Details and photos in the Aug. 26 Albion News and Petersburg Press, Print and E-Editions.